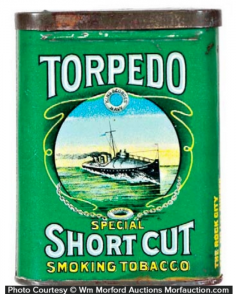 Although many others existed, there were four major tobacco companies active in Canada during the period most collectible tobacco tins were made. These tins are an integral part of the hobby and tins manufactured by the Canadian major tobacco companies: Imperial, Rock City, Tucketts, and Macdonald are featured in countless tin collections. For most tin collectors, probably the most interesting tobacco company in Canada after the turn of the century was Rock City Tobacco Company. Although a much smaller company than the giant Imperial Tobacco Company, Rock City’s brands are widely considered to have more character and its tins are general more memorable. The navy, which has always been a fascination of Canadian tobacco manufacturers became an obsession with Rock City. 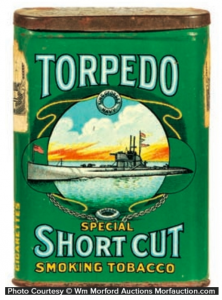 At one time in the 1920’s you could buy Rock City tobacco in tins titles American Navy, King George Navy, World Navy, Britannia, May Flower, Navy Plug, Ocean and Torpedo. The company was founded in 1899 in Quebec City by Napoleon Drouin with Joseph Picard as an associate and partner. 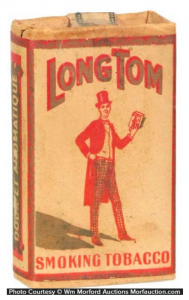 Drouin had been a wholesale grocer who specialized in the sale of leaf tobacco from his store on the corner of Smith and Couronne streets in Quebec City. The name Rock City comes from Quebec City’s fortress-like location atop a massive rock facing the St. Lawrence River. It is regarded as Canada’s Gibraltar. Rock City’s first factory was established on Dorchester Street located on the banks of the St. Charles river which was navigable at the time. Drouin was well entrenched in the Quebec establishment and the registration of the Rock City Tobacco Company was the first professional act of lawyer Edmond Traschereau, whose brother Alexandre was the premier of Quebec. Drouin later went on to become the mayor of Quebec City from 1910-1916. Although both were advocates of the St. Jean Baptiste Society, and were dedicated to the preservation of French Canadian culture, Drouin and Picard were savvy enough to realize that majority of their business potential lay in the English speaking western Canada. 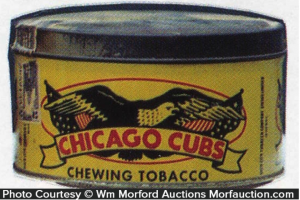 In an attempt to develop this market, the names of their biggest brand typically had strong American overtones such as Chicago Cubs, Bat, Old Glory, Long Tall, Polo and Mountie. 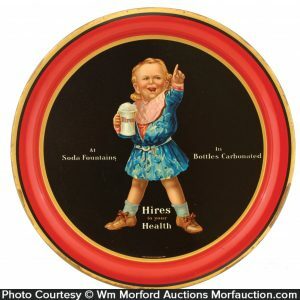 Two early brands for which tin collectors have shown particular fondness are Poker and Kodak. Interestingly, the Kodak brand was heavily contested by George Eastman and his newly formed film company Eastman Kodak. In Quebec, Rock City’s French focused regional brand included Bon Bourgeois, Champlain, Eskimo, Wigwam, Mon Jardin (“My Garden”) Pierrot and Petit Rouge. Four other brands that will appear to advanced tin collectors are Moterman, Ocean, Fast Line and Ottoman. The Rock City Cigar Company across the river in Levis, Quebec was a subsidiary of the tobacco company and manufactured Check, Muriel and Laurier brands of cigars and was known for having a picture of the Canadian Prime Minister on every box. Rock City also operated a large wooden box manufacturing business requiring about 2 Million feet of timber on an annualized basis. Half was used for the companies products, most notably cigar boxes while the rest was sold to a large corset manufacturer. 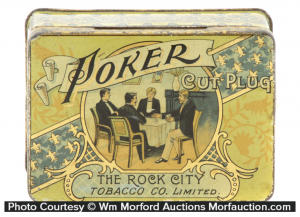 Rock City had primarily been in the pipe, chewing and smoking tobacco business and struggled to develop in the fast growing cigarette business. 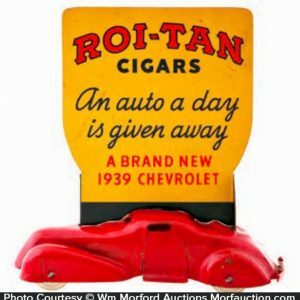 As cigarettes began to dominate the market, in 1935 Gus Picard, the nephew of the Joseph Picard traveled to England to try and interest the large Carreras Company of London to establish several of its cigarette brands in Canada. As a result, Carreras bought control of Rock City and introduced their Craven A brand which became very successful. 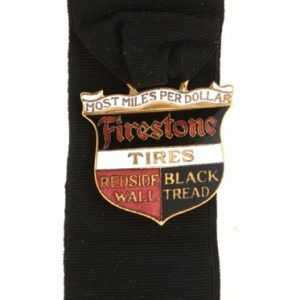 In 1938, they followed with another successful product known as Black Cat. Finally, in 1957, the South African company Rothman’s famous for their Pall Mall brand bought out Carreras while maintaining many of their popular brands.